3. I will console them in their pains, and I will accompany them in their work. 5. I will defend them in their spiritual battles with the infernal enemy, and I will protect them at every instant of their lives. 6. I will visibly help them at the moment of their death; they will see the face of their mother. Abyss of suffering, Pray for us. 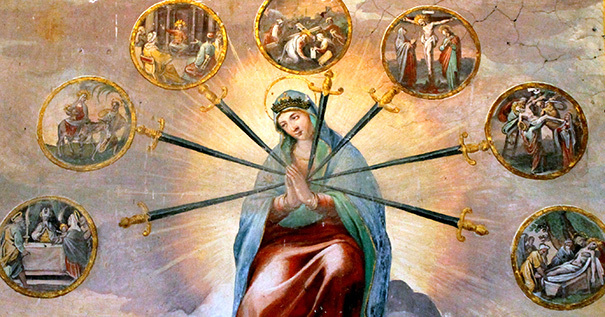 Allayer of tempests, Pray for us. Look down upon us, deliver us, and save us from all trouble, in the power of Jesus Christ. Amen. Let us pray: Imprint, O Lady, thy wounds upon my heart, that I may read therein sorrow and love--- sorrow to endure every sorrow for thee, love to despise every love for thee. Amen. 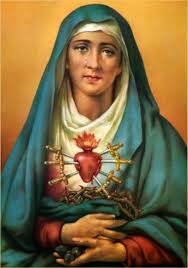 in honor of the Most Holy Heart of Mary.